Old Rectory is a private home built by Captain George Dew around 1699 and is one of the oldest buildings in Bermuda. George Dew was initially a pirate and a slave trader. Subsequently he was reformed and became a nice man. He later practiced law and even became a member of the House of Assembly. But this old house which is located in St. George's town, became well known for another reason. Alexander Richardson, a bishop lived in this house between 1763 and 1805. He was the rector of the St. Peter's Church and therefore the house was named as such. But it never was a rectory. Richardson had a nickname ‘The Little Bishop’. 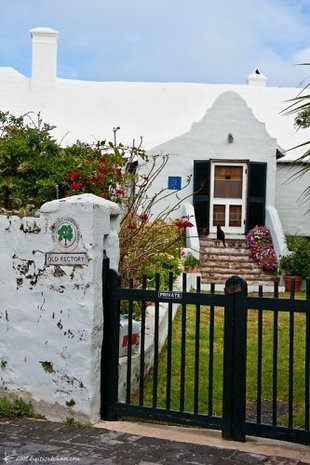 Old Rectory with its wonderful garden setting is an example of an old traditional Bermudian architecture. It is built with white limestone. There is a short welcoming armed staircase that leads you to the main door. The windows are placed high under the eaves. Inside, you will see cedar beams. There are multiple chimneys on both sides of the house. The chimney on the eastern side is separated from the roof which indicates that the original roof was perhaps a thatched palmetto roof and required to be safeguarded from kitchen heat and fire. Other great features of the house includes its cellar, fine stone gutter etc. The original house had a long rectangular front wing. Another strange feature of the house is its eastern most roof - here the triangular roof structure is higher than the other section. The property is owned and managed by Bermuda National Trust. It is open to visitors usually on Wednesday afternoons between November to March. The Trust also rents out this property for private residential use. However recently, the use of the property as private residence has become restricted. There is no admission fee. Donation is accepted though. Update November 2015: Old Rectory is now available on monthly rent for residential purpose. This 2-berroom cottage with original cedar paneling in the master bedroom and surrounding large cottage garden is a great opportunity to live in one of the oldest homes in Bermuda. There is 1,600 sq. ft. living space, air-conditioning in master bedroom, upgraded kitchen, laundry, car park etc. The monthly rent is $2,850. Contact Bermuda National Trust for info and booking. 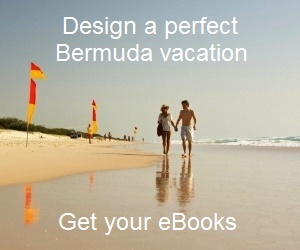 Check out Bermuda Tourist Map to view the location and other attractions nearby. 2) Check out Bermuda Museums for great museums & historical buildings in Bermuda.